Editor’s Note: Thanks to our new Arts and Culture Coordinator (and NYC Dads Group member) Adam Gertsacov for this kids show review and thanks to TADA! Theatre for welcoming us for a Meetup! As you may know, I have recently been asked to serve as the first Arts and Culture Coordinator of the NYC Dads Group. (and if you are an arts organization and want to get involved with a lot of great dads, you should contact me!) My first event was working with TADA! Theatre to host a meetup of Dad’s at their brand new show ADVENTURES FROM EZRA JACK KEATS. A LITTLE ABOUT TADA: Since 1984, TADA! 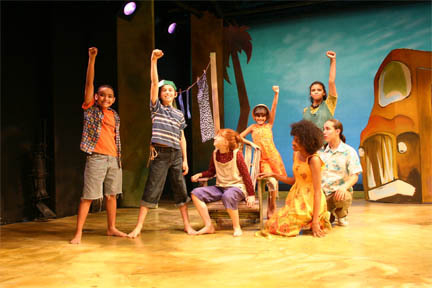 has been creating high-quality musical theater productions performed by talented kids for family audiences while at the same time providing kids with the opportunity to harness their inherent energy, build their self-assurance and realize their true potential through the unique collaborative art form that is musical theater. Through TADA!’s high-quality work, young people gain confidence and learn commitment, responsibility, communication and teamwork…skills that are critical to their success both in school and in life. 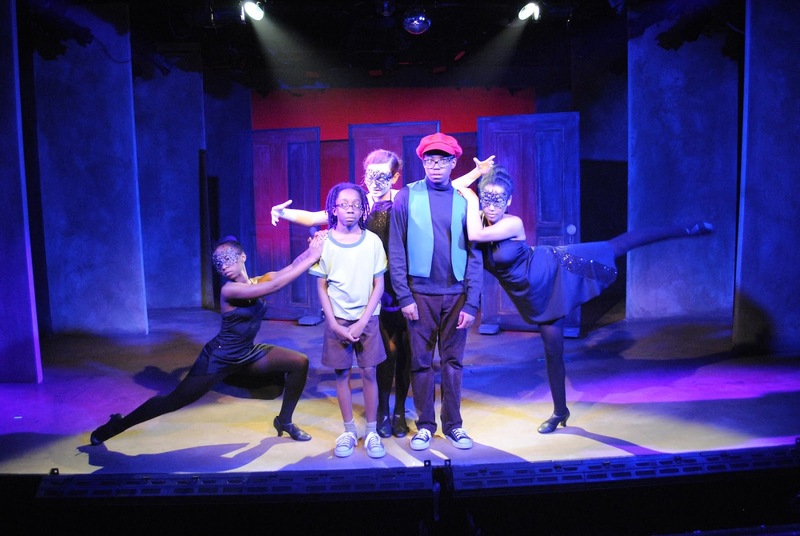 All of the shows are written and directed by a professional director, and they are performed by members of their Youth Ensemble. Kids performing for kids. At the end of each show, the curtain call is the TADA Theme song, which is a great song and gives you a good sense of what you saw/will see/what they are about. 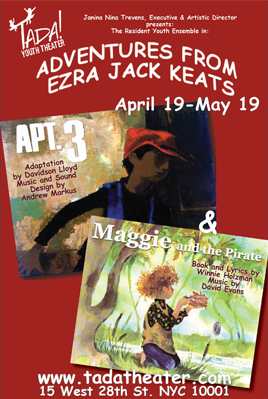 The show we saw, ADVENTURES FROM EZRA JACK KEATS, consisted of two original musicals based on the works of beloved children’s illustrator and author Ezra Jack Keats In case you don’t know, Keats is the author of a number of classic kids books, most memorably THE SNOWY DAY. The first show, Apt. 3 is a dance theater piece where the sound of a saxophone music somewhere behind closed doors sends two brothers Sam and Ben snooping through their tenement halls. They encounter all sorts of sounds and all sorts of people, from a bickering old couple to a variety of pets to a number of television programs. They finally meet a musician, who gives them a clue on how to use their ears to listen to the music that everything in the building makes. Not sounds or noise, but music. in between the two pieces. There were lots of funny elements, and both Maggie and the Pirate were clearly very talented (as was the whole cast, really.) At the end of the story, a surprise occurs when the narrator turns up in a pretty important role, and we learn why he’s the narrator.. The songs were all pretty catchy. My 4.5 year old show LOVED this show, partially because a cricket cage is also in the chapter book The Cricket of Times Square, which we are currently reading. (Don’t know why, but crickets were apparently super popular pets in NY in the 1940s and 50s!) I have a feeling that when he gets older, he might end up being a TADA kid. (It was also our second show of the day, as we had gone earlier to see a French Circus Le Grand C at the New Victory Theater, which he also loved. ) I know that all of the other dads who went were also really happy that we’d come out to TADA! In both of the plays, the sets were all great, the costumes were fine, but most importantly, the acting was really good. The kids inhabited their parts, sang the songs, danced the dances, told the stories, and made some really great theater for us. And what could be better than that? I counted 27 performers, and they all did a great job. And that’s what a great theater experience (both attending and performing) is all about. As part of a special discount for NYC Dad’s Group MEMBERS, TADA is offering a discount on Sunday 4pm shows. Use the code: DADSLOVETADA and get a free kids’ ticket when you buy an adult ticket (no shows on Sunday May 12, Mother’s Day) This is good for the Sunday 4 pm show only, subject to availability. Adam Gertsacov is an actor, clown, director, husband, and dad living with his wife and son in Yonkers, NY. He blogs at dadapalooza.com, clownlink.com, and with the NYC Dads Group. He and his wife are the founders of the Digital Family Summit, a first-of-its-kind annual conference where teens, tweens and their parents connect to learn how to live as a family in the digital world.